Rapid technological advances offer organizations across all industries the potential to gain competitive advantage. Yet, while these advances may provide unprecedented opportunities for innovation, they can also create unanticipated conflicts that impede progress. Purpose-built infrastructure, vendor lock-in, and exploding data volumes stifle innovation and put market leadership at risk. To avoid ...such crises, more IT leaders are implementing open source cloud solutions to meet changing business needs. This is especially true when security and industry compliance requirements are vital considerations. Enterprise open source cloud solutions can help IT organizations achieve or exceed service levels, and they offer the flexibility and scalability businesses need. SUSE OpenStack Cloud* provides organizations an open source private cloud solution that includes a broad range of capabilities and integration opportunities. 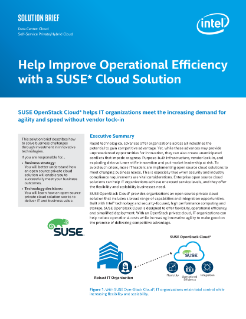 Built with Intel® technology and security-focused, high performance computing and storage, SUSE OpenStack Cloud is designed to offer flexibility, operational efficiency, and simplified deployment. With an OpenStack private cloud, IT organizations can help reduce operational costs while increasing innovative agility to make good on the promise of delivering competitive advantage.